Holy Spirit Church - Stained Glass Inc. In 2011 the Holy Spirit Church of McAllen, Texas underwent a huge remodel and contacted Stained Glass Inc. for help. 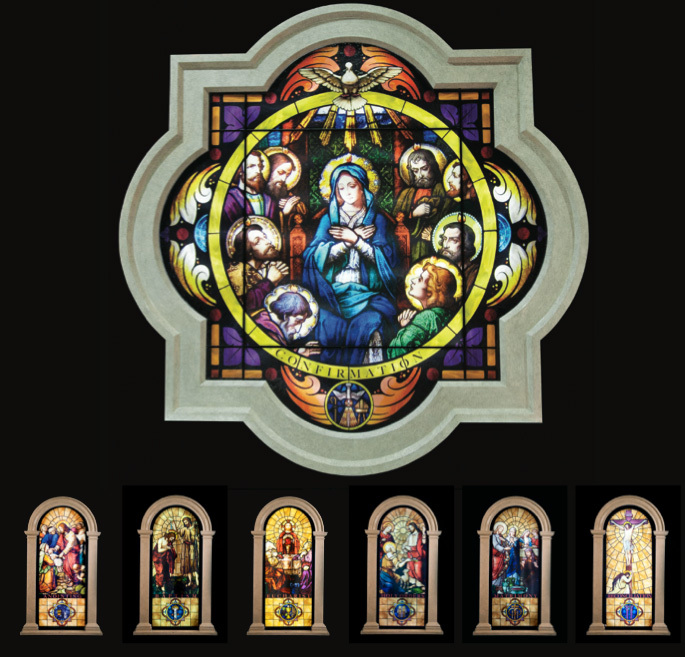 The Holy Spirit Church wanted stained glass but had no existing windows in their church sanctuary. Lyndon Stromberg, owner of Stained Glass Inc. and the Stromberg Group suggested that Holy Spirit Church add LED backlit stained glass "windows" to their church décor. These "windowless windows" look like regular stained glass windows but are actually framed stained glass panels with built in LED lights that hang against the wall like a painting. They can be plugged in and simply switched on and off whenever the light is needed. They provide beautiful shining stained glass even after the sun has gone down or for early morning mass before the sun has even begun to rise. The Holy Spirit Church is now graced with a huge 14' x 12' backlit stained glass window depicting a dove that represents the Holy Spirit as well as large stained glass images of the Seven Holy Sacraments. These stained glass window panels surround the sanctuary and add colorful light and an inspirational and peaceful ambiance to the church building. Besides providing the large backlit windows, the Stromberg Company also created an altar that features a stained glass image of the Last Supper as well as a wall hanging crucifix, a pulpit and decorative columns for the remodel. The pastor at Holy Spirit Church, Monsignor Brum is very happy with the stained glass windows provided by Stained Glass Inc. When I look at them I am enlightened by their symbolism. They inspire me to concentrate better on the Lord's presence. In addition to this inspiration they also bring the awareness, meaning, & importance of each Sacrament in our lives as Catholics.